This is a great salad. 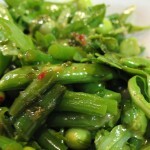 The veggies (sugar-snap peas, broad beans, green beans and, of course, edamame) are crisp, flavorful and sweet. The dressing is gingery and spicy and not too oily. 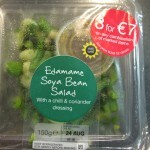 I’ve nothing bad to say about this salad except that it’s hard to pair with anything from Tesco. Oh, and the green beans are a bit squeaky.